Kabuki Symptoms:Katrín was born nine weeks early, coarctation of the aorta (repaired at 2.5 months), 3 months in the NICU, typical facial characteristics including high, arched eyebrows, long eyelashes, long palperbral fissures with lower lids turned out, broad flat tipped nose, large protruding earlobes, high arched palate with cleft of uvula, prominent fetal pads, short curvy fifth fingers, 3 abnormal vertebrae and a sacral dimple, excess hair grown on lower back and shoulters, hypotonia, and under-developed hips which required surgery at the age of 4. Katrín was born way too early, which only added complications to her already fragile form. At the time, the family was traveling in Sweden and Ella barely made it to the hospital before Katrin graced this world with her presence. She would spend 10 days in the NICU in Sweden before she was stable enough to be flown by a medical plane back to Iceland. Ella and the rest of the family wouldn’t fly back for three days after that because they had to fly commercial. Those first two weeks were the hardest, with being in another country and peaking a second language, but the family persisted. 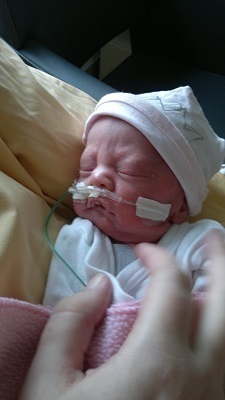 Katrin remained in the NICU for three months, during which time she had her coarctation of the aorta repaired. After leaving the NICU, Ella and Ketil had a hard time getting information from the doctors. 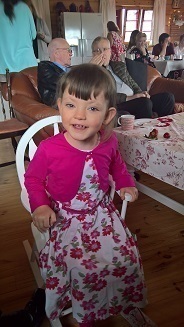 No one seemed to know if Katrín had a genetic disorder, even testing for Down’s Syndrome, which came back negative. When Katrín was five months old, their geneticist finally told them that he suspected Kabuki Syndrome. The decision was made to undergo DNA testing and have the samples sent to Germany for diagnostics. 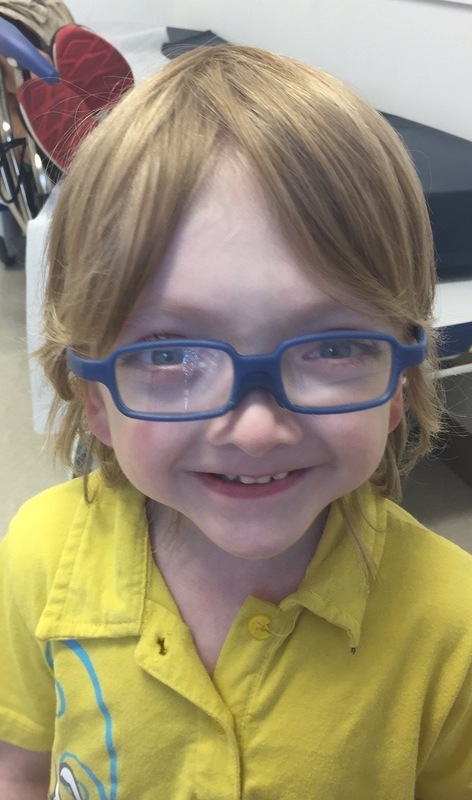 Eight agonizing months later, the results were in, and Kabuki Syndrome was confirmed. 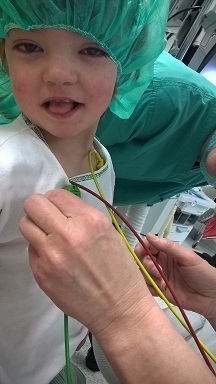 Since getting the diagnosis, Katrín has had some serious obstacles. At 2.5 years old, she contracted a life-threatening lung infection and they nearly lost her. A week of IV antibiotics kept her with them, though. Because of her underdeveloped hips, Katrín required surgery at the age of 4. The surgeon put in a plate and screws to keep the femur in place, and then took them out 11 months after surgery. 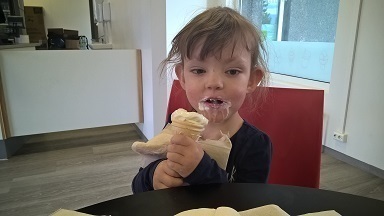 Earlier this year, shortly after Katrín turned 5, her doctor discovered a strange looking spot on her chest and removed it for biopsy. Turns out it was a rare form of benign melanoma, but since they removed the spot there was no need for further treatment. Katrín continues to develop at her own pace. She’s not potty trained, despite months of rigorous effort. It seems she doesn’t realize she has wet herself. Her speech is still difficult for others to understand, even though she sees a speech therapist once a week. She is behind in both fine and gross motor skills, but receives weekly PT and occasional OT for those. From the beginning, Katrín Sara KetilsdÓttir has determined just how things would go and when it was time to operate or see a new specialist. She only tube fed for three months, and while nutrition was involved for weight gain, she does well now although she does show some food intolerances. 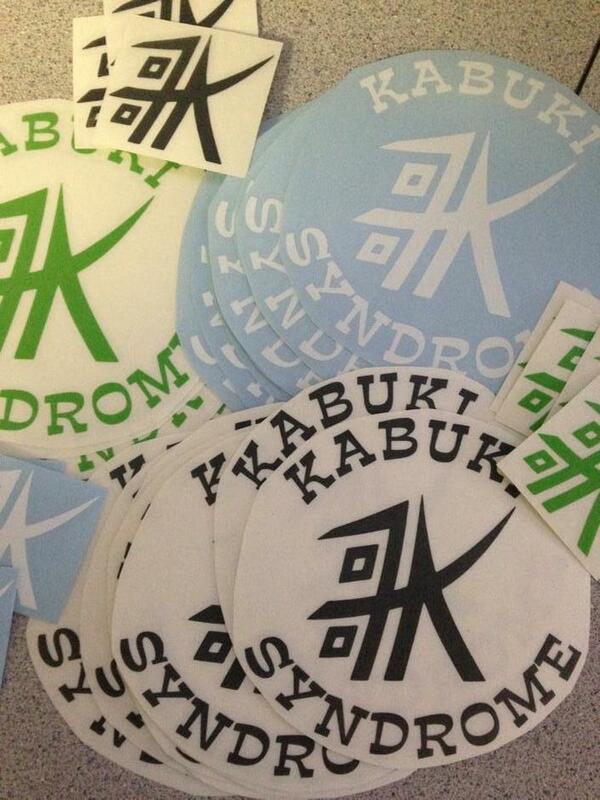 She’s had surgeries and labs and scans and everything else that a Kabuki Kid goes through early in life. And just like our other KK’s, she is determined to make this life her own. Katrín Sara’s Relationship With Her Siblings: Katrín’s siblings are extremely loving towards her, and always have been. And she adores them as well. Katrín’s siblings are patient with her, they let her play with them in lots of different activities. They love to help her with anything, and always want her included. Ella and Ketil tossed around the idea of getting a support family who would take Katrín for one weekend a month, but the other kids put their foot down and said that if she went then they were going too! Advice for parents of “typical” children: “Feel free to be specific to your child or give a general idea, whatever you prefer! That variety is what makes this world so beautiful and that everybody deserves a chance. Please look at the ability not the disability because my girl HAS so much more than she is lacking. Teach your children that there is beauty in everybody and that everybody matters just as much. 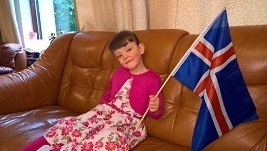 How Katrín has impacted the family: “It has made me more patient for sure! It really has changed my whole world. It has made me stronger than I thought I could be and it has made me more appreciative of the fact that life is precious and we can’t take anything for granted! I’ve learned that even though nobody can do everything, everybody can do something. I also now realize that every child learns at it’s own pace and that that is ok! It has taught me a lot about God – and how He sees us, imperfect as we are and He just LOVES us… He loves when we take the steps some take for granted and He cheers us on, even when we feel we’re not doing enough. And how God is proud of us even when we fail other peoples standards, because He sees we’re trying our best, and our best is ALWAYS good enough for Him! It has taught me, more than ever, to enjoy today, enjoy the moment; enjoy every victory. It has taught me perseverance!!! It has softened me, made me less judgmental and more supportive of others. It has made me a better mother, a better wife, a better friend and all in all a better person. It has taught me never to take a doctors word for it, if my mom instinct says otherwise! It has made me a warrior, where I may have been timid before. It has made our family so much stronger – it has taught our children to appreciate that different is beautiful and acceptable! It has helped them see the worth in every single person and how EVERYBODY matters! The broken, the sick, the poor, the outcasts – are all precious and created to be loved and cherished. It has taught me that life goes on weather I clean my house today or run 5 miles or am “productive” in any way and that it is ok to sometimes just be. It has made me think differently about the future – I plan differently and way different from what I ever thought I’d even have to consider. I worry about things for my bukibear that I didn’t even think about with my other kids – like school and friends and family/children, education, work and all kinds of other things I use to just think came naturally or more I just did not think about at all. It makes me think if she’ll need help with life when we’re gone and if her brother and sister will carry that load and even if it’s fair to ask them to. It has brought out the true colors of those around us. We KNOW who our friends are now, and who was just along for the jolly ride. It has taught me that it’s ok to be vulnerable! And on particularly rough days, when I doubt if I can endure, I like to remind myself that my track record for getting through bad days so far is 100% and that's pretty good. Katrín Sara may be just five years old, but she’s already made an impact around the globe. She’s a happy, adorable, fun loving little girl who deserves nothing more than to be loved by many. Her journey is in the early stages, and watching her grow up will be a pleasure and an inspiration to so many people! We, at ATK, would like to extend heartfelt thanks to Ella Birgirsdottir for all of the help she and her family have given to help make ATK what it is today. Thank you!